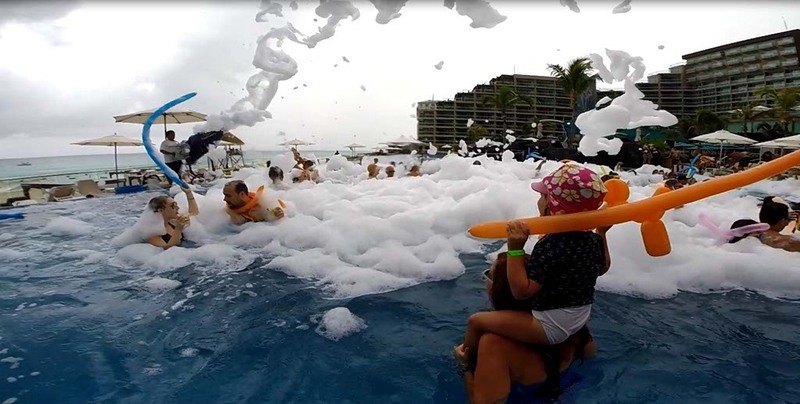 Once a week, Hard Rock Hotel Cancun has a bucketlist worthy Foam Party in the pool. 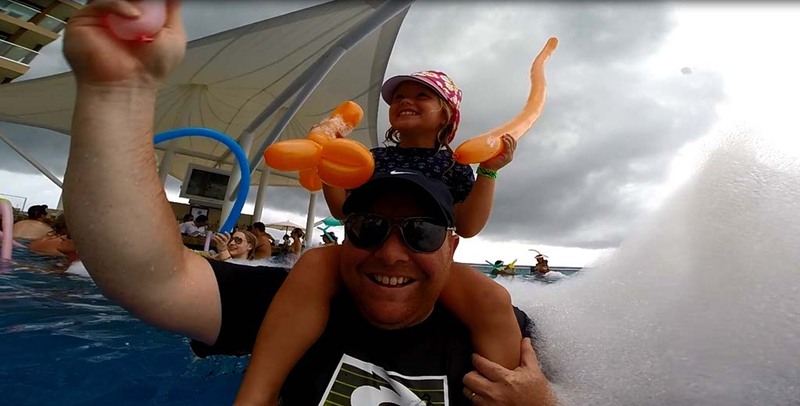 With Athena on my shoulders, a balloon in my hand and foam all around, I partied like was 21 again. It was the most fun I had at an all-inclusive resort yet it’s a weekly event for Hard Rock Hotel Cancun. I thought I was too old and too family-focused to still party like a rock star but it’s possible to do both at Hard Rock. The party was scheduled for 1 pm. The rain started to pour down in buckets and I thought they might cancel the party, but I must have forgotten where I was or who I was partying with because the heavy rain was added fuel to party harder. There must have been 100 people in the massive pool when the foam started to blow out over the crowd. Athena, Darren and I were right in the middle of it. The foam was so high that we needed to put Athena on our shoulders to see her. She didn’t stop smiling and couldn’t believe they were allowed to make such a mess with the bubbles. She kept telling me that we needed to do this in our bathtub. There was a live DJ and dancers to keep the party jumping. Rather than making us feel awkward about partying with a child, Athena was invited up on stage to dance with the performers. She soaked it up! She danced and laughed while everyone cheered. Some people wouldn’t consider putting their child up on stage to dance with women in their bikinis, but I was happy for her to see women celebrating their bodies and not embarrassed to dance and have fun. We took turns putting Athena on our shoulders because she wanted to stay for the entire party. Even when we were tired from carrying her, we found a way to make it work. She didn’t stop smiling the entire time. Tons of other guests chatted with us and partied with us, making us feel welcome. 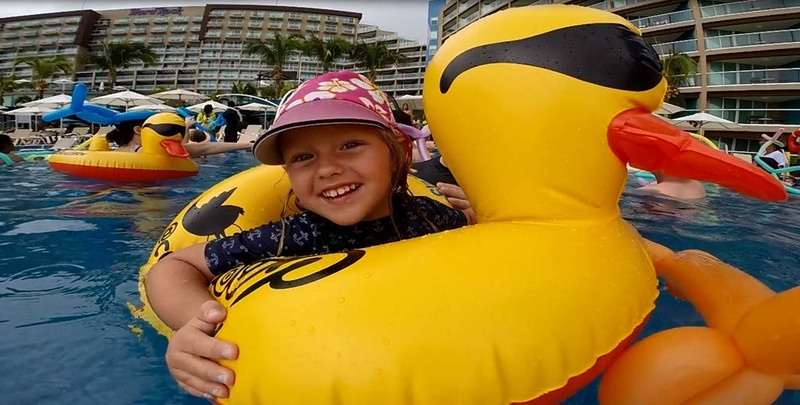 At Hard Rock Hotel Cancun, anyone, any age, can party like a rock star. This was just one moment in time from five days of Hard Rock style. Thanks to Hard Rock Hotel Cancun, we were able to find our inner rock star. You are amazing! You make being a mom sound easy and traveling with kids seem possible. Thanks for being such a good role-model for future parents. I’m grateful for a wonderful, happy child who makes it easy for me. It’s not always perfect, but we have a wonderful time together. Athena is the happiest child on the planet. I guess I would be too if I got to do all the cool things she does. Cherish every minute. Before you know it, she’ll be asking you for the car. We just booked our stay at Hard Rock in Cancun. We were back and forth about here or anything place further away from the airport but this looks too good to pass up. Thanks for the photos and great detail. You just never know from websites. They all look good. We’ll think of you next month when we’re floating in that pool. I’m so excited for you! Please let me know if you have any questions. I really do love Hard Rock and I’d be happy to help out if you need anything. That sounds really awesome. What a great idea for them to pump the foam in. I love it. YES! This is what I want to hear, that partying doesn’t have to stop after you have ‘weans’- too many of my friends suddenly have no life when a sprog comes along, start them early I say! Its awesom & indeed a bucketlist worthy. Thanks for sharing. Oh this looks like fun! The kids lol like they’re all having a blast too! I wouldn’t have imagine going to a party like this with a child, but you made it work and from the photos I can see what a great time she had! 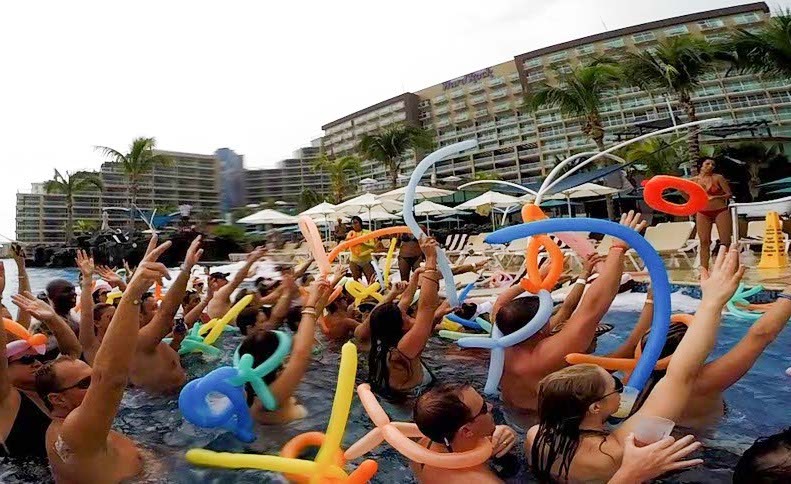 That looks like an awesome party You can always count on Cancun for a fun-filled time. I love going to Mexico since it’s so close to California. I’ll have to check out the party at Hard Rock! That’s funny that they didn’t judge you for bringing your daughter, and that they included her in the fun instead! Glad you had a good time! That looks like so much fun! Isn’t it great when you can actually enjoy yourself so much with your kids? I bet she remembers that for the rest of her life.